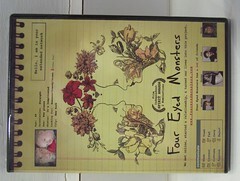 Finally, months after having ordered it, I opened my mailbox and saw that the Four Eyed Monsters DVD had arrived! Arin, Susan, and the 4em crew seem to be having some financial trouble; hopefully getting the DVD shipped will start to turn things around for them. Four Eyed Monsters is a film that could only be made—and fully appreciated—at this moment in time. It had a limited showing in Chicago and a 1-day release in Grand Rapids at the UICA, so I know most of you probably missed it while it was in theaters. Now you have an opportunity to catch up. The DVDs are $19.99 and have episodes from the video podcast and a bunch of other special features that might actually be watchable, as opposed to most special features. If you don’t want to buy it and help some independent filmmakers recoup their expenses, feel free to borrow it from me (or make me watch it with you). It wasn’t breathtaking. There was no special effects budget and there were no moments of directorial brilliance. Still, the autobiographical script was compelling and original. The movie’s even more fun if you follow the background story online. Four Eyed Monsters: a romantic dramedy version of Blair Witch for the MySpace generation. Now that I’ve written a line like that, I must cleanse myself.